Slow Cooker Carnitas Breakfast Tacos made easy with marinated pork, scrambled eggs, beans, cheese, sour cream, and salsa. Start pork the night before and wake up to ready to eat carnitas for a decadent, Mexican-style breakfast. If it’s not clear by now, I’m a bit obsessed with Mexican food. I crave it so much it’s now become a breakfast item. 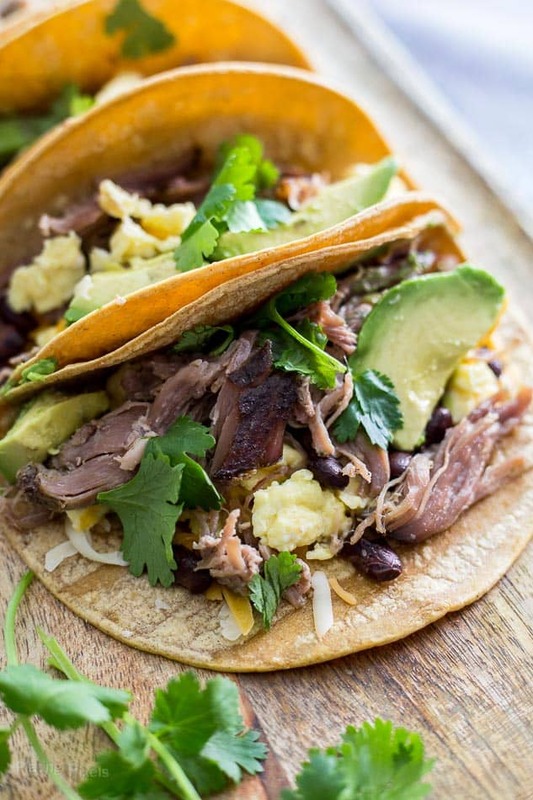 These Slow Cooker Carnitas Breakfast Tacos will help to satisfy that craving. The combination of flavors may be outside of the usual pairing, but scrambled eggs go surprisingly well with slow cooker carnitas. What’s even better about this recipe is the suggested timing. Start the seasoned pork the night before in a slow cooker. Set on low for at least 8 hours, then let it stay on warm. 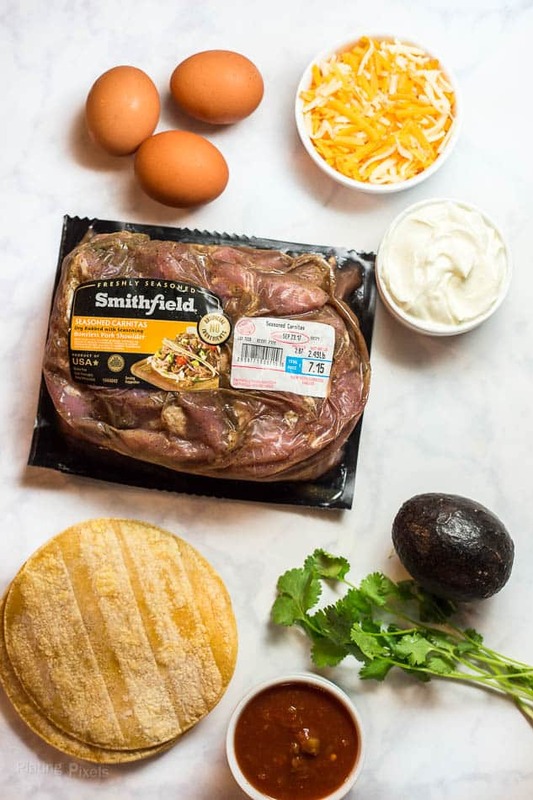 You’ll wake up to a house full of meaty, savory carnitas smell. Maybe it’s the food lover in me, but this is just as good as waking up to the smell of freshly brewed coffee. Carnitas literally means “little meats” and is a traditional Mexican meat dish made by braising or frying shredded pork in oil or lard. My version of carnitas is much healthier and I’ve omitted the oil and fat and instead slow cooked the pork just in a simple marinade. I used Smithfield Marinated Boneless Pork Shoulder Seasoned Carnitas. It saves you time with pre-seasoned carnitas flavor, while providing quality 100% pork with natural ingredients. 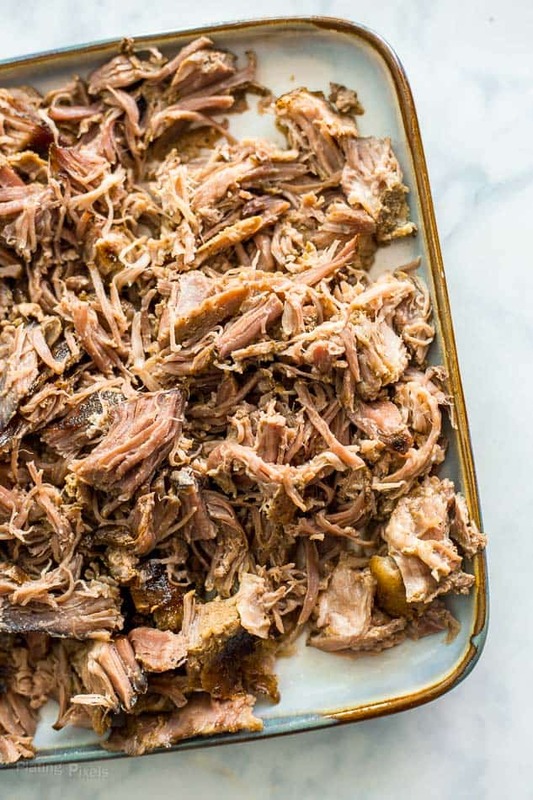 Slow cooker carnitas is made simple, no extra seasonings or ingredients needed. PRO TIP: Shred the pork and you’re ready to start your Slow Cooker Carnitas Breakfast Tacos. I recommend broiling the carnitas in a single layer once cooked to add a bit of crispness, but is entirely optional. Place pork in a slow cooker. Cover and cook on low for at least 8 hours or high for 4 hours (Note: you can do this the evening before so it’s ready for breakfast). Drain any excess liquid and shred pork into small pieces. Optional: Before serving, broil on high in a single layer on a baking sheet until edges are crisp, about 5 minutes. Whisk together eggs, milk, salt, and pepper. Scramble in a greased non-stick pan over medium heat; stirring often until fluffy and cooked. Heat or toast tortillas. Top each with the desired amount of carnitas, scrambled eggs, shredded cheese, salsa, avocado, sour cream and/or cilantro. You can prep the pork the night before, cook on low for 8 hours and it’s ready for breakfast or brunch. 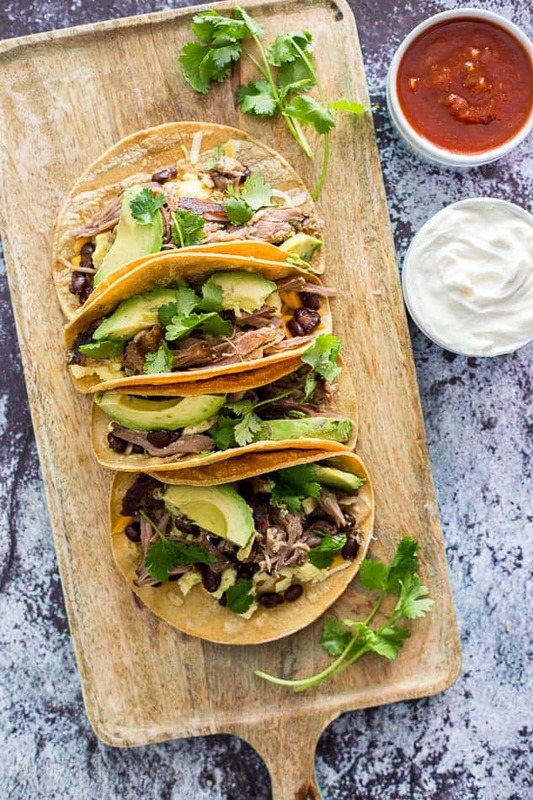 You can easily customize these tacos and make them your own with your favorite Mexican toppings. Looking for some heat? add in some pickled jalapenos or opt for hot salsa. You can swap the beans for pan fried potatoes which will also work really well for breakfast. Store leftover pork in the fridge for 2-3 days or freeze in a Ziploc bag or container for longer storage. When it comes to toppings the list is endless. 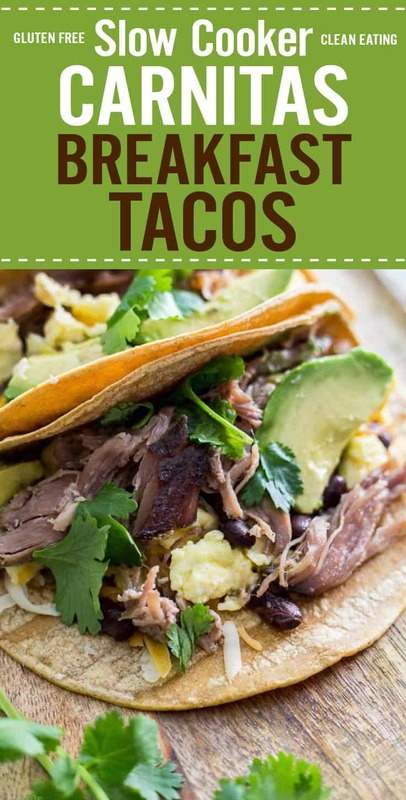 Add scrambled eggs, and Mexican-style ingredients like beans, salsa, cheese, sour cream, avocado, and cilantro in a corn tortilla to complete your Slow Cooker Carnitas Breakfast Tacos. Another option is to make these into burritos or quesadillas and pack as a unique lunch for work. You can even use leftover pulled pork in a torta with your favorite veggies, coleslaw or cheese or add it to salads with Mexican rice and grilled vegetables. 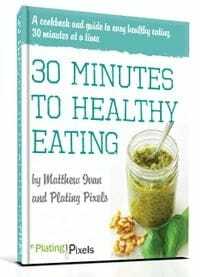 With pre-seasoned pork carnitas and a slow cooker, breakfast, lunch or dinner can be a whole new experience and fast. 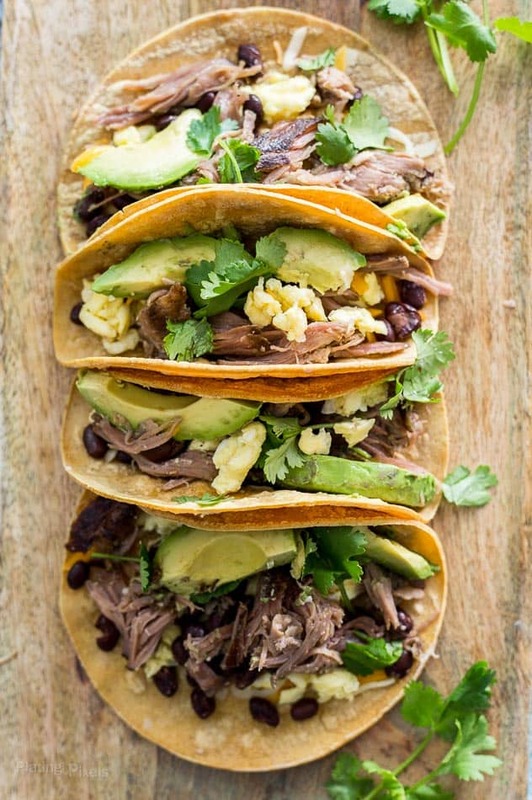 Easy Slow Cooker Carnitas Breakfast Tacos fast with scrambled eggs, beans, cheese, sour cream, salsa and avocado. Removed pork from package and place in a slow cooker. Cover and cook on low for at least 8 hours or high for 4 hours (Note: you can do this the evening before so it’s ready for breakfast). Drain any excess liquid and shred pork into small pieces. You'll have extra carnitas for additional tacos or leftovers. Optional: Before serving, broil on high in a single layer on a baking sheet until edges are crisp, about 5 minutes. Whisk together eggs, milk, salt and pepper. Scramble in a greased non-stick pan over medium heat; stirring often until fluffy and cooked, 5-7 minutes. Heat or toast tortillas. Top each with desired amount of carnitas and remaining ingredients. You can prep the pork the night before, cook on low for 8 hours and it's ready for breakfast or brunch. These don't need to be just for breakfast you can enjoy them for lunch or dinner too! Store leftover pork in the fridge for 2-3 days or freeze in a ziploc bag or container. Will try on next trip to Walmart to find Smithfield marinated pork. So far no one has it. The recipes look fab. Thanks Wanita. You should be able to find it at the regular stores as well as neighborhood markets. Good luck. Mexicans are amazing to make a dinner dish into a breakfast dish and get creative for a morning start among other dishes like Pozole and Menudo can’t leave out Chorizo. Love this. When I think of a breakfast taco I think of a lot of eggs and hardly any meat, this is so the opposite. Going to have to make this soon. These look gorgeous! Something we definitely don’t do enough in the UK is tacos, particularly for breakfast, so I think I’m going to have to start! Thanks so much! I hope you do Cliona. Haha I totally agree Jenn! Tacos for breakfast is an awesome idea! And the recipe sounds fabulous! I’m glad you agree, thanks Denise! Taco are always great! Thanks Denise! Yep it’s an awesome combo. Thanks Alvaro!